Ballast water discharge from a commercial shipping vessel. In larger vessels it may take up to 24 hours to take on and/or discharge ballast from one of the tanks. Inside the cargo hold of a large ocean-going transport vessel. 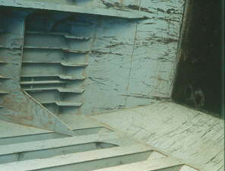 Ballast water is used to stabilize vessels during voyages by providing trim, increasing draft, and managing stress on the vessel during voyages. With over 80% of all goods transported by shipping, an estimated 79 million tons of ballast water are discharged annually in the U.S. from vessels originating outside the Exclusive Economic Zone or EEZ (Carlton et al. 1995). Globally, it is estimated that over 3,000-7,000 organisms are carried in ballast tanks daily (Carlton 2001). With over 45,000 vessels moving goods about the world, it is no wonder that ballast water has been singled out as a significant vector for new marine species introductions. The potential for organisms to survive in foreign ports is more likely if ballast is taken up in ports where coastal organisms thrive and discharged in similar coastal waters. Even small vessels may have ballast water in their tanks. We are concerned about the continued increase in marine transport and the increasingly short times to travels that permit organisms to thrive in ballast tanks before discharge. Despite efforts to stem the release of ballast water from foreign vessels into our coastal waters, coastwise traffic is not yet mandated to minimize discharges. The potential to introduce new species from ballast water remains a significant concern. Over the past couple of decades, commercial shipping has adopted guidelines, and in some countries regulations, that require treatment of ballast water before it is discharged. Globally, the International Maritime Organization has adopted guidelines for exchanging ballast water at sea before vessels enter the Exclusive Economic Zone (EEZ) of each country. It instituted a reporting process and is currently adopting standards to support development of technologies to treat ballast water. The U.S. Coast Guard has adopted regulations requiring all vessels entering the EEZ to have exchanged ballast water and is also reviewing how best to encourage development of technologies that treat ballast water to prevent new introductions. Although this is an important step in preventing and minimizing introductions, other vessel discharges may also be a problem. Is there a problem in the Northeast? Coastal traffic in the northwest Atlantic carries goods from the north (Canada) to southern ports and returns with ballast that is discharged in port or along the route. Based on the reporting forms and the general pattern of traffic, there is minimal release of ballast in the northeastern U.S. states, but greater volumes, many of which originate in ports from Cape Hatteras and north, are discharged en route to Canadian ports. It is a misconception to assume that smaller volumes of ballast release do not introduce new species. Over the past few years, sea squirts and crustaceans have been found throughout the region (Pederson et al. 2005). The issue of addressing coastal traffic ballast water management emerged as a high priority for the region and one that could be addressed regionally prior to international or national regulations. Although recommendations have been made for developing Alternative Ballast Water Exchange Zones that are intended to minimize introductions from vessels traveling within the EEZ, the northeast states and Canada have not collaborated to develop an international policy. Currently New York State has adopted regulations to manage both foreign and coastwise traffic ballast discharges. As individuals, we can communicate with our state and federal legislatures in support of regulations and enforcement to minimize introductions from ballast water. Even small vessels may have ballast tanks and should not be a source of introductions. Carlton JT (2001) Introduced Species in U.S. Coastal Waters. Pew Oceans Commission, Arlington, Virginia. Carlton JT, Reid DM, van Leuwen H (1995). The role of shipping in the introduction of nonindigenous aquatic organisms to the coastal waters of the United States (other than the Great Lakes) and an analysis of control options. Report to the U.S. Coast Guard, Washington, D.C.
Pederson, Judith 2002. Ballast Water Management Workshop: Regional Solutions, MIT Sea Grant College Program, Cambridge Massachusetts. Pederson, Judith 2003. Ballast Water Exchange: Exploring the Feasibility of Ballast Water Exchange Zones in the North Atlantic, MIT Sea Grant College Program, Cambridge Massachusetts.